Remodeled, spacious, top floor loft condo! New hardwood floors throughout! Freshly painted kitchen cabinets with new counter tops and updated lighting! 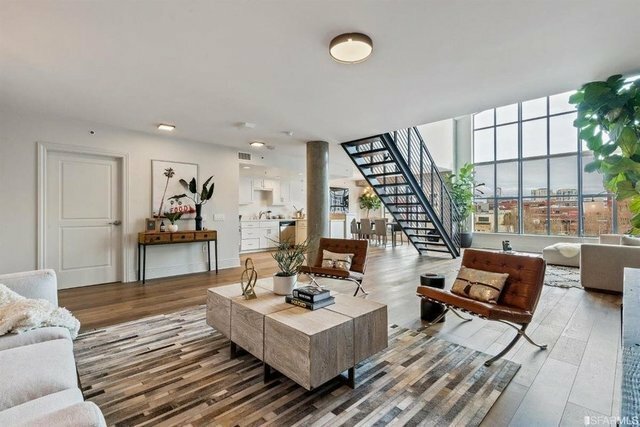 This stylish live/work loft boasts 2 enclosed bedrooms, and an expansive living room-dining room combo. Kitchen is well-equipped with Stainless Steel appliances (DCS gas range w/exterior venting hood). The wall of windows bathes the unit in natural light. Upstairs you will find the large enclosed loft, in unit washer dryer, and enclosed master suite. Central Heat and A/C. Just steps away to Cal-Train and 2 blocks to AT&T Ballpark! This is commuter's dream!! !